They have drinks named "birth", "death", "old age" and "suffering"
The cafe opened in January with a white coffin as its main attraction. Bangkok: A death-themed cafe in Bangkok offers its customers the unique experience of being able to contemplate their lives while lying down in a coffin, and for a discount on their coffee. 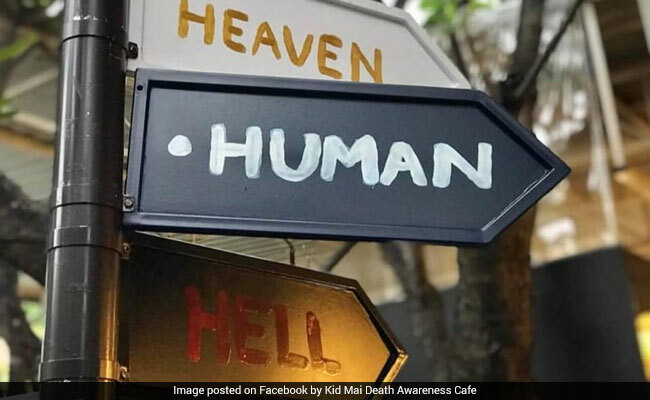 "Our main goal is to convey the Buddha philosophy based on the teaching that having an awareness of death decreases greed and anger," Veeranut Rojanaprapa, the creative brain behind Kid Mai Death Awareness Cafe, told Efe news on Saturday. The entrepreneur and scholar blames capitalism for distracting people in Thailand from Buddhist teachings. The little taste of death he offers intrepid customers who lay down in the coffin sees them come out as better human beings with inner calm and less greed and anger. With drinks named "birth", "death", "old age" and "suffering", the cafe opened in January with a white coffin - surrounded by floral scepters and chairs creating a wake-like environment - as its main attraction. After the cafe-goer settles in the box, a staff member helps the customer to close the top to prevent the entry of the last glimmer of light, although two tiny holes allow air to enter. "The client may stay inside as long as he wants. At first he sees it as a new experience, but at a certain point he begins to ponder issues such as what is the purpose of life," says Veeranut. Customers do not take long to express their reactions after leaving the coffin and they put their thoughts in a scrapbook attached to the fictitious grave. "Death is a wise counsellor, there is only one life and therefore we must overcome our fears and abandon our pettiness... Without awareness of death everything is trivial, ordinary," a customer said while recounting his experience. As customers walk around the cafe, they can see some paintings on the wall have questions written on the frames, such as, "Are you happy with what you do? ", "Is there someone waiting for you at home? ", "What is your goal for which you work so hard?" Customers can also write their last wish, plan their future funeral rites or write a letter that will be sent to them in 10 years. Superstition and belief in life after death, in the form of ghosts or spirits, deeply rooted in Thai society, prompted some neighbours to complain about the cafe and its macabre theme. No customer could forget the epitaph-like quote written on a floral wreath attached to the coffin: "Eventually, you can bring nothing".